A military-influenced liner jacket, striped tee, shoulder bag and more. COMME des GARÇONS’s newest line, the digitally-driven CDG label, has issued a new selection of branded gear. The youth-oriented brand is more focused on branding and wearability over austere cuts and silhouettes, ensuring that this latest capsule is more accessible than intimidating. 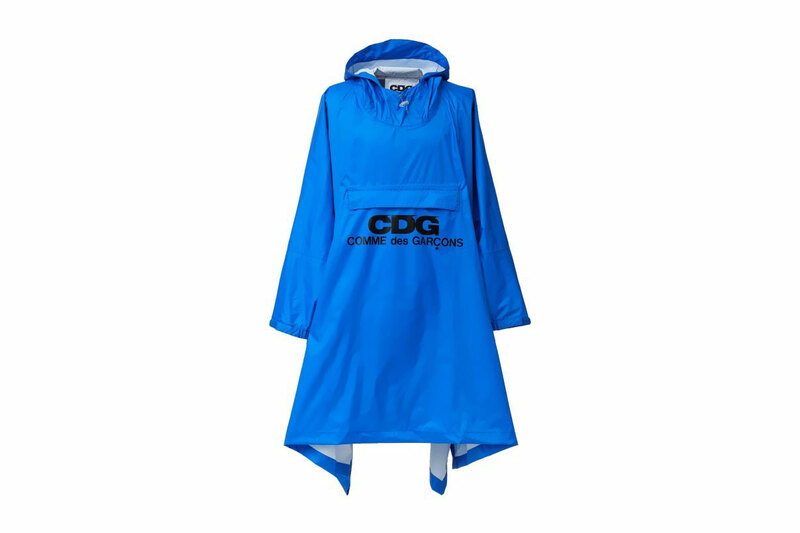 A selection of layering pieces place the CDG branding front and center, printed in black on the front of a red- and white-striped shirt, grey hoodie and blue poncho, the latter of which sports a kangaroo pocket and adjustable hood. Elsewhere, a quilted, military-inspired jacket offers an angled take on the CDG branding on its rear, and a shoulder bag features a circular logo in white against a black base. The items are currently available at CDG’s Seoul, Osaka, Shibuya outposts, and they’re likely to arrive at Dover Street Market locations shortly. For more graphic ponchos, take a look at UNDERCOVER‘s recent collaborative rainwear drop. size? Upgrades Vans Style 36 With "Patchwork"
Including a message inspired by 03 Greedo’s incarceration. Nike's Air Flightposite 1 Strikes Back in "Dark Neon Royal"